exemption to all aviation fuel and enshrined it in dozens of bilateral aviation treaties between countries. These agreements should be reversed. There is no reason why today’s car drivers, small businesses and truckers should have to pay fuel tax while large commercial airlines can operate without having to make such a basic contribution to government coffers. Contrary to common perception, the 1944 Chicago Convention only precludes taxation of aircraft fuel in transit, a provision which can be seen simply as a safeguard against double taxation. the direction of the flight, to reflect their estimated emissions. Tax exemption of aircraft fuel contained in the tanks of an aircraft arriving at a Community airport is based on the provisions of the 1944 Chicago Convention. However, the exemptions granted to aircraft fuel, loaded to a carrier at an EC airport, are granted on the basis of bilateral Air Service Agreements concluded between Member States and third Countries and among Member States themselves. The Commission favours taxation of aircraft fuel, as is the case for fuel used by other means of transport. The Commission presented a Communication on taxation of aircraft fuel in 2000 (COM(2000) 110 of 02/03/2000) and brought this issue for discussion at the ICAO’s 33 rd Assembly in September 2001. It appeared from the discussions that it will be very difficult, if not impossible, to reach an agreement on this issue at ICAO level. During the discussions, which preceded the adoption of Directive 2003/96/EC, all but two Member States agreed that as a matter of principle commercial aircraft fuel should be taxed on the same basis as any other fuel. However, the question of competition with third countries needs to be taken into account and any distortion of competition with socio-economic implications has to be avoided. The Convention on International Civil Aviation, also known as the Chicago Convention, established the International Civil Aviation Organization (ICAO), a specialized agency of the United Nations charged with coordinating and regulating international air travel. The Convention establishes rules of airspace, aircraft registration and safety, and details the rights of the signatories in relation to air travel. The Convention also exempts commercial air fuels from tax. The document was signed on December 7, 1944 in Chicago, U.S., by 52 signatory states. It received the requisite 26th ratification on March 5, 1947 and went into effect on April 4, 1947, the same date that ICAO came into being. In October of the same year, ICAO became a specialized agency of the United Nations Economic and Social Council (ECOSOC). The Convention has since been revised eight times (in 1959, 1963, 1969, 1975, 1980, 1997, 2000 and 2006). Article 1: Every state has complete and exclusive sovereignty over airspace above its territory. Article 3 bis: Every State must refrain from resorting to the use of weapons against civil aircraft in flight. Article 5: The aircraft of states, other than scheduled international air services, have the right to make flights across state’s territories and to make stops without obtaining prior permission. However, the state may require the aircraft to make a landing. Article 6: (Scheduled air services) No scheduled international air service may be operated over or into the territory of a contracting State, except with the special permission or other authorization of that State. Article 10: (Landing at customs airports): The state can require that landing to be at a designated customs airport and similarly departure from the territory can be required to be from a designated customs airport. Article 12: Each state shall keep its own rules of the air as uniform as possible with those established under the convention, the duty to ensure compliance with these rules rests with the contracting state. Article 13: (Entry and Clearance Regulations) A state’s laws and regulations regarding the admission and departure of passengers, crew or cargo from aircraft shall be complied with on arrival, upon departure and whilst within the territory of that state. Article 24: Aircraft flying to, from or across, the territory of a state shall be admitted temporarily free of duty. Fuel, Oil, spare parts, regular equipment and aircraft stores retained on board are also exempt custom duty, inspection fees or similar charges. Article 30: The aircraft of a state flying in or over the territory of another state shall only carry radios licensed and used in accordance with the regulations of the state in which the aircraft is registered. The radios may only be used by members of the flight crew suitably licenced by the state in which the aircraft is registered. Article 32: the pilot and crew of every aircraft engaged in international aviation must have certificates of competency and licences issued or validated by the state in which the aircraft is registered. Article 33: (Recognition of Certificates and Licences) Certificates of Airworthiness, certificates of competency and licences issued or validated by the state in which the aircraft is registered, shall be recognised as valid by other states. The requirements for issue of those Certificates or Airworthiness, certificates of competency or licences must be equal to or above the minimum standards established by the Convention. Article 40: No aircraft or personnel with endorsed licenses or certificate will engage in international navigation except with the permission of the state or states whose territory is entered. Any license holder who does not satisfy international standard relating to that license or certificate shall have attached to or endorsed on that license information regarding the particulars in which he does not satisfy those standards”. There are very few regulations which are truly global and those that are we tend to take for granted. The laws of soccer are the same in Samoa as they are in Sudan. Ships have navigation lights and flags in the same places and the radio frequencies which can connect mobile phone users in Russia and Peru have also been universally approved. Flying an aircraft from one country into or over another may seem like fairly uncontentious act but there is just one set of international laws of the air and they were agreed on December 7th, 1944. 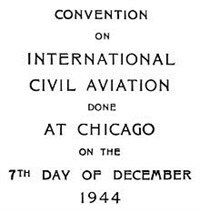 It took nearly 1,000 people from 54 nations, crammed into the Stevens Hotel in Chicago, 37 days to agree the Convention on International Civil Aviation, or the Chicago Convention as it is now known. It is a remarkable document – a blueprint for the foundation of a civil aviation industry which would unite the world, drawn up at a time of intense global conflict. It needed ratification by 26 States to become law – which came into effect on 4 April 1947, 30 days after the 26th State had ratified the Convention. It now has 191 signatories. History students looking back at the event now could well be forgiven for asking “why?”. Didn’t world leaders have more pressing items on their agenda at the time? The origins of the document really date back to 1942, when the agendas of allied leaders were even more crammed – but even then they knew that civil air transport would play a huge role in international relations when peace came and the more quickly the world could be united by peaceful aviation links the better it would be for everyone. Which makes the Chicago Convention a little more than a fairly interesting international treaty – it is a truly historic document which lays out a future of peace and prosperity which was truly visionary. Reflecting on the way it was developed has parallels with international processes at play today (indeed I am currently at the UN Climate Talks in Lima). ICAO 70TH Logo2 BannersThe fact that war was continuing to rage may have added a uniting pressure to the discussions, but I think one of the most important differences in negotiations back then was the faith governments had in their negotiators. They were true plenipotentiaries – people entrusted by their governments to make decisions and take actions on their States’ behalf. Today, negotiators at conferences such as that taking place here in Lima have constant mobile phone and email contact with their leaders back in the capitals, who seldom have an idea of the pressures of the negotiations, nor of the nuances at play in the room. The Chicago Convention, battled out over 37 cold Chicago days in late 1944, has really stood the test of time and provided the humankind with a valuable document that helped to grow an industry and change the face of the modern world. Aviation: Benefits Beyond Borders and enviro.aero have been established by the commercial aviation industry body, the Air Transport Action Group (ATAG). Posted: Monday, December 8th, 2014. Filed in General News, Recent News.